Since I generally write pretty favorably about these Drinks of the Week, you might be forgiven if you assume that I am like the proud daddy who loves all his boozy children equally. That, my tippling brothers and sisters, is simply not the case. Among newer drinks — especially drinks that have been pitched to me by the alcoholic industrial complex — I try never to steer you towards anything that I wouldn’t gladly make for myself. However, I am more inclusive when it comes to older drinks. Heck, someday I might even try out recipes for some very well known drinks I personally dislike, such as the highly-effective but (usually) mildly disgusting Long Island Ice Team or the incredibly over-sweet Harvey Wallbanger. Those drinks hail from the 1970s — a golden era for most film lovers but the very nadir of the dark ages for cocktailians. Today’s drink, however, comes to us from the 1930s or earlier and is yet another of the thousands of recipes featured in “The Savoy Cocktail Book.” It might be named after the cigarette brand, it might not. It does, however, introduce me to a cocktail ingredient that, as far as I can remember, I have never previously tasted. I speak of creme de menthe, a liqueur that is basically just mint and/or mint flavoring, alcohol, and sugar. As you might guess, it tastes like a liquid candy cane. Is that a good thing or a bad thing? Well, I’ll be figuring that one out over the coming weeks. In the meantime, let’s get started on this week’s drink. Combine all the ingredient in a cocktail shaker with plenty of ice. Shake and strain into a chilled cocktail glass. Prepare for a surprisingly minty experience and drink up! I have to admit that my first go-round with the Pall Mall Cocktail was more than a little alarming. The only creme de menthe I had on hand, from an airplane bottle bought at a bargain price, was of the bright green variety, which you are not supposed to use in Pall Mall Cocktail and for good reason. The result was in a drink that looked only slightly better than what happened a day or two later when my sink backed up. It tasted slightly better than it looked, but that was obviously no great praise. The bittersweet notes in Carpano Antica also seemed to be a big problem. My housemate/guinea pig liked it even less than me. Subsequent tries with a more standard Martini sweet vermouth and DeKuyper’s white creme de menthe, proved a lot better, or least more inoffensive. Make no mistake, however, that little teaspoon of creme de menthe dominates the flavor of this drink, and it doesn’t always play well with the herbal flavor in the gin and dry vermouth, especially. Finally, a note on gin. This is one of a bunch of recipes found in The Savoy Cocktail book that call specifically for Plymouth Gin. These days, that refers to both a style of gin and a brand, as the only brand of Plymouth style gin these days is, in fact, Plymouth Gin. (It’s herbal flavors are probably every so slightly fruitier than what you’ll find in the kind of gins you’re likely used to.) 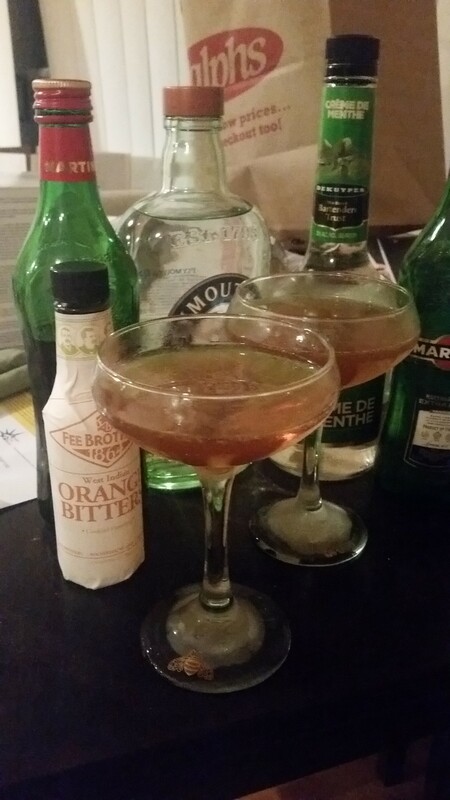 So, I mostly used Plymouth when making these drinks. However, using Bombay Dry Gin didn’t ruin the drink, at least assuming it wasn’t ruined to begin with.